A beautiful dress in display at store might look awful when you try it. Dressing is an art and wearing clothes accurately as per your body type and personality is important. It will make you feel more confident and attractive which is every woman’s wish. Shopping is enjoyable but it can get confusing and difficult at times. There are number of styles, colors and sizes available in market which can make you feel overwhelmed. But you need not worry, we have listed tips and pointers which will help you choose good clothes in a much easier way. Life is not less than a party then why not to dress like it! Saree is most appreciated and loved dress by women all over globe because of their ethnic and elegant charm. The outfit is a traditional wear and is also famous in other Asian countries. 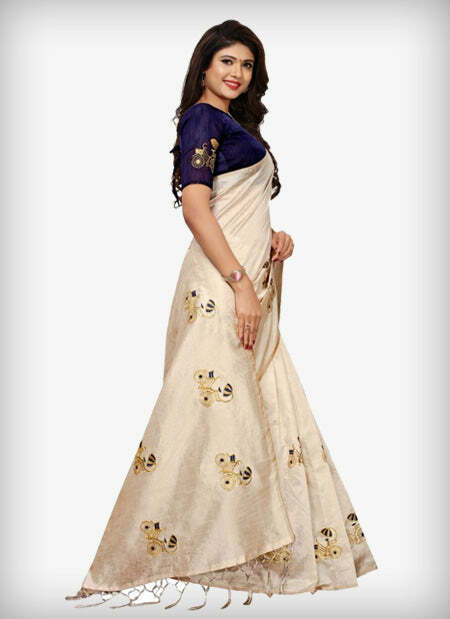 The style of saree is dependent on region and hence there are number of ways it can be draped. Many designers are embracing the garment to make it most classy outfit with present fashion industry trends. It exists as most widely used women dress from centuries and is still glamorous and most gorgeous female outfit. The immense variety of colors, patterns and styles of saree is exciting as well as confusing. As the new options flock the fashion bazars, variety of sarees at any store keeps on increasing with time. It is important to choose a saree which is comfortable and suits your taste, body type and reflects your true personality. Sync it with Occasion- It is important to buy appropriate saree if you are buying it for any specific event or occasion. Cultural norms should be kept in mind while finalizing the saree. For example for Navratri pooja, a red colored bandhni with mirror work will be a superb choice. Know the latest trends- You should keep latest fashion trends in mind when you are choosing saree for a wedding, reception or any other party. Make sure they fit in your personal requirements as everything which is trendy does not mean it is best for you. Transparent materials like net, chiffon and lace are very popular these days. An extra bling of embroidery, delicate jewelry and high heels will give you a jaw dropping look for a night party. Never compromise on quality- It is important to pay attention to the quality of material. There are numerous fabrics available in Indian market, so it is suggested to check the authenticity before buying a traditional expensive saree. Fashionmozo assures quality product and services. You will get exactly what is uploaded in pictures at our website. All the products are of good quality and are reliable. Choose as per your body type- Different types of sarees look good on different body types. Chiffon is very diaphanous and light, hence it is not a suggested material for a curvy body. Georgette can be worn on almost all kinds of body type. Silk comes in varied varieties from heavy work pieces to light translucent pieces. Every saree has its own charm and elegance. All women will agree that having a few kurtis with couple of leggings makes it all sorted for at least few months. Kurtis are exceptionally comfortable, elegant and versatile. Women of all age wear kurtis nowadays. They are suitable for every occasion be it office meeting, a regular college day or an evening birthday party. Pairing it with different lowers like jeans, pants, palazzo and skirt gives different style to your vista. There are different patterns of kurtis which are suitable to different age groups. Indo Western kurtis - These are must have and staple of every young girl’s wardrobe. It is suitable for all body types and it gives a big platform to experiment with style. They can be paired with jeans, leggings, jackets etc. Floor length kurtis and Anarkali kurtis – Both the kurti styles are suitable for parties as they give ethnic looks. Heavy earnings look classy with these kurtis. They are available in flares as well as in straight cuts which can be picked up as per personal preference and body type. It can be styled with a pair of legging or palazzos. Over layered kurtis - Overlays are multilayered kurtis and are trending casual outfits these days. They come in flowing materials like chiffon, rayon cotton and georgette. These are suitable for petite, hourglass and inverted triangle body types and look amazing when paired with culottes, pants and ankle length leggings. Printed kurtis - Printed kurtis are evergreen as there are no boundaries in printing patterns and color combinations. Batik prints, block prints, floral prints, kalamkari, digital prints and much more are there in the list of beautiful prints. Pairing them with rich embroidered dupatta will give a party wear and grand look to the outfit. Avoid wearing printed kurtis with printed bottom. Flared kurtis - Flared kurtis are elegant, chick and are suitable for both casual and formal look. Both sided swing and bounce in the outfit makes the kurti look very attractive. They can be paired with Churidars and high heels to add little extra style to the overall outlook. High Low kurtis - The asymmetric kurtis are variants which do not have definition. They can vary in length at front and back with straight hemline. They look beautiful with jeans, leggings and jeggings. It is perfect for informal set up and can be paired with funky accessories and flats. Do you often feel lost in textile outlet when you go there to buy dress material? We totally understand the pain of searching perfect dress material so we have few tips which will help you to buy a good fabric for your art of dress-making! The color and pattern are the factors which come to your mind at first while selecting a dress fabric. But the quality of fabric, its sewing behavior and suitability to your body are equally important considerations for fabric buying decision. Make sure fabric does not have any deformity in fibers and printing. Factors like type of fabric, fasting of colors, type of dress to be stitched and shrinkage etc are also critical while getting a dress material. Cotton Dress Material - It is the most comfortable dress material. It is cool and breezy, hence perfect option for summer outfits. The material is easy to maintain and is very durable. They are not very expensive. Prewashing is suggested for cotton dress material as the natural fabric in some cases gives shrinking issues. Silk Dress Material – It is the luxurious dress material which is soft and really smooth. Silk is one of the best choices for dress making. There are numerous types of silk available in market like Khadi silk, Tusser silk, Chanderi silk and crepe silk etc. They give perfect functional outfits. Few types of silks need dry cleaning only whereas few can be washed at home. They come in different colors and patterns with many embroidery layouts. Rayon Dress Material - The material is extremely light and flowy which makes it suitable for dress that needs swirling touch. It drapes on the body very well and this is the prime reason that many outfits at stores are made up of rayon only. They are also suitable for blouses, shorts, skirts and pajamas. You can get beautiful dresses stitched with this fabric and it is low maintenance as well. The dress materials are available with variety of bottom wear like palazzo set, dhoti set, skirt set and running material which can be stitched into regular salwars, straight pants or churidars as per your choice. Fashionmozo offers a collection of dress materials with variety of patterns like Bandhej, Gota Patti, Banarasi, Georgette, Chanderi, Chiffon and much more. The pieces have exotic embroidery designs which will give an edge to the outfit. Straight Lehenga - This is the most famous lehenga style in demand and fashion. Av a bridal wear dress. A-line Lehenga - A-line lehnga is fitted near waste and flared at bottom. The style looks best in fabrics like silk, brocade and cotton. It is not suitable for plum and curvy body but if you have perfect abs or skinny structure then it will give you an astonishing look. Fish Kali Lehenga - Available in fabrics like crepe, georgette, silk, net and tissue, these lehengas give perfect fit and look for wedding or reception party. They are available in different colors but dark colors are well suited for this style. Every woman wish to stand out in crowd and the wonderfulness of trendy bottom wears will surely give you that look. It is always a question and pain to choose a perfect bottom for your stylish top or kurta. You open your closet and then get confused in choosing between regular denims, tights, leggings, palazzo pants or a regular salwar. Fashionmozo brings different bottom wears of different lengths which will give stylish look to all your outfits. Palazzo pants are clearly dominating fashion industry from decades. The wide legged pants were favorites in 60’s to 90’s and are trending even today. The can be worn as both casual and formal outfit.. These are extremely comfortable, light and airy which makes it perfect for summer wear. They look classy if worn with considerations of modern fashion world. We offer a range of bottom wear like dhoti, palazzo, pants and skirts etc which are available in different colors and patterns. Bottoms can give you a Western as well as traditional look depending on what kind of upper wear you wish to slip on. Here are few key points to be kept in mind while buying new ones for your wardrobe. Choose right fabric - Picking up the appropriate fabric is extremely important. Chiffon or Georgette are better fabrics for plump women whereas as skinny women should go for silk or brocade. The former will give a swirly look and the later will give a stiff look to the lower. Flares - Palazzos or pants come in varied length and flares at the bottom. Every pattern does not suit everyone, so select the right design to get a classic look. However, the quantification of flares is not possible. It all depends on what kind of kurta or top you are wearing. Straight bottoms look good with long tops or Anarkali kurta but palazzos with rich flares look great which mid length straight kurtis. Prints - Printed bottoms are trending these days. Vibrant colors of prints give them eye catchy look. You can choose prints and colors as per your choice. Bigger prints with crop tops and lace tops with printed palazzos look perfect for a casual look. Ditch the printed ones for a formal outlook. Accessories and Footwear - Adding accessories will complete your spectacular look with palazzo. Color coordinated neck piece and earnings will give a theme to your appearance. Talking about footwear, you can opt for stilettos for a formal event. In case you are wearing it for a casual outing then you can pair palazzo with flats. Bottoms go well with all kind of footwear except boots.